On Day 90 of our 120 Day Upper Room Prayer Campaign we see the power and purpose of the wilderness seasons of our life as we praise God for our passing from wilderness to promise! God had chosen David to be king over Israel. This had been prophesied over him as a child in his father’s house. Yet once the Word of the Lord was spoken over David’s life and the Spirit of the Lord came upon him, you would think he would be caught up in a whirlwind of exciting events as he was placed on the thrown. But that’s not how it happened, with God that’s pretty much never how it happens. David received this prophetic word of the Lord over his life, the Spirit of the Lord rested upon him, and the anointing was poured out on him, then he was sent back out to tend his father’s sheep in the fields. Nothing spectacular happened. No instant promotion, no glitz, no glam, just mocking brothers, a dusty field, and a bunch of needy sheep. You see, David had been promised but was not yet ready to be positioned. He had been anointed but had not yet had his faith in that anointing proven that he would rightly and confidently know how to use it. God had announced the show, but had only begun to set the stage for it. David was humble and lowly among his people and even among his own house. It would take a miracle to make him King, and that is exactly how God does things. Before David could be King, God would have to do something very unexpected, something that only God could do that would put David’s name in the mouth of the people and prove God’s approval of him. This event would take great faith, as would the events that followed it, for once men see the favor of God on you, some will sing your praise, while others slander your name, and others still will seek to kill that which God has ordained. This was going to take faith. So God did not send little David out to the palace where guards, grandeur, and great abundance reside. He sent him into a sheep fold where weakness, wounding, and wondering reside. In the palace men learned how to put on a pretty show, but in the pasture David learned what God wanted him to know. In the palace men learned how to be celebrities, a king after men’s own hearts, but in the pasture david learned how to be a Shepherd, a King after God’s own heart. David learn how to lead the flock by walking where he expected them to walk. He learned how to mend up the broken, how to set at liberty those who had become bound up, how to defend the defenseless, and how to depend on the strength of the anointing to do it all, even in the face of impossible resistance. Yes, God was going to do something that would put this humble unknown boy’s name in the mouths of all Israel. He was going to cause him to defeat a giant that no one else had the courage and faith to face. But first God had to build that faith into David’s spirit. This could not be done in the palace with all it’s protective walls, armed guards, disconnect from others, and ease of life. This had to be done in the pasture, this had to be rooted in love for the flock he had been given charge over. David had invested all into this little flock in the wilderness. It was all he had, an impossible promise and a little flock of sheep. David loved his little flock, he had raised them up himself. Therefor when a lion arose to devour them, he (for loves sake) would not let them be destroyed. Little David put his own life on the line to fight for this little flock and the Lord made him victorious. Then came a bear, a stronger foe seeking to devour his little flock, yet David having his faith in God’s deliverance strengthened by his encounter with the lion, bravely stood his ground against the bear as well and was yet again victorious. David knew that God had delivered him and his flock from these foes and had used his hand to do so. So when the day came that Goliath challenged Israel and mocked the power of her God, David knew that this foe would be no different. So much had God built little David’s faith in the pasture defeating lions and bears in the Name of his God, that while others were running from the fight in doubt, David was literally running to it in faith. In this did the people see the heart and power of a true King, chosen, trained, and anointed by God Himself, that all the glitz of the palace could not counterfeit. God’s ways are not our ways, they are higher then our ways, but they are perfect in all of their ways. If God has truly called you to do great things for His Kingdom, then don’t be surprised if He puts you in a pasture instead of a palace. He has a plan. True Pastors are made in Pastures, not palaces. The lessons learned and the faith earned in the battles overcome in the pasture are the only thing that make a King worthy of the Name of our Lord God and Master. Man’s Kings are trained in palaces but God’s Kings are trained in pastures. So be encouraged. Love, learn, wait, anticipate, and believe. What the Lord has spoken, He will cause to be through the abundance of His impossibilities. In the meantime, grow in faith and grow in grace so that when the stage is all set, you will run into place. God had just miraculously moved in mighty ways to deliver the Israelites from Pharaoh. God had brought them out of Egypt and defeated their enemies in the Sea before their very eyes. All of Exodus chapter 15 was a song of praise that they sang to God about how He had so moved to bring forth such undeniable and miraculous victories against their foes! Yet as soon as the singing stopped and chapter 16 begins we see that they went from praising God for His great power and might, right into the wilderness of Sin and began murmuring against Him, His methods, His wisdom, and even the very power that had just brought them this great victory. The name of this wilderness is by no means a coincidence. In the native tongue, it meant “thorns“. If you recall, thorns did not exist on the earth before sin, but came about because of sin (which is a lack of faith). When Adam and Eve lacked faith in what God said, they doubted what God had originally told them and sinned. Therefore, mans original sin was a lack of faith, or “unbelief“. Because of this “sin“, the ground was cursed and “thorns” came up making life very hard for Adam from then on (Genesis 3:18). Therefore, this wilderness full of thorns was called Sin for they are one in the same, cause and effect. Therefore when Jesus bore our sin, did He bare also a crown of thorns. Jesus expounds upon this truth in His telling us of the good seed that was sown in thorny ground. He explains that the good seed is His word. It is planted and grows and even produces good fruit! This represents a person who has heard the word of God and received it! It was planted in them and began to manifest through them. It was producing fruit which is the evidence of the faith in our hearts manifesting from our lips and lives! 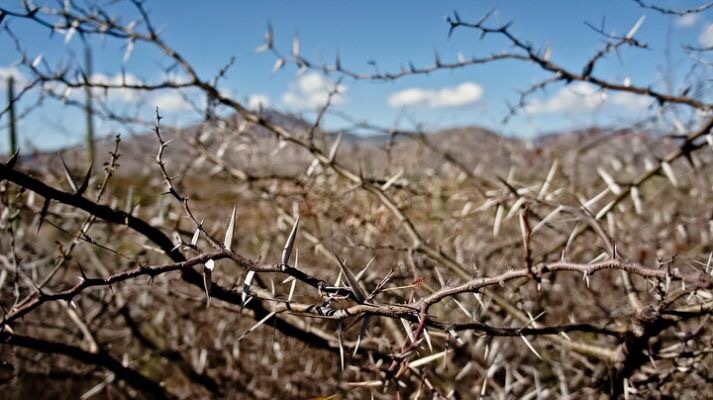 But then these thorns come up and choke it out that it dies! Jesus tells us that the thorns are “the cares of this world”, in other words, fears, worries, doubts, distractions, deceitfulness of riches, a desire for the easy way. In other words, when things got less easy then they gave up the struggle, and the faith in them in what God had both told them and done, died. The thorns stirred up unbelief in the words that God had planted in them and even with the fruit of it laying right before them, they gave up and the thorns won and took over. This is exactly what happened to the Israelite’s. God had told them to do something. He had given them the promise of victory and reward. He had proven His words with great deliverances and victories already! Yet even as the fruit of this lay right before them, as soon as the struggle started to get tough and faith was required to press on, they entered the wilderness of Sin, “the land of thorns”, unbelief sprung up, and they began to murmur their doubts against both Moses and God. Sadly, just like for Adam these thorns of sin would prove to make their lives very miserable from here on out. This began their wondering in the wilderness as they tried year after year to achieve victory their own way in their own strength by their own means and could not, for promise only comes by faith. Therefore was the Promised Land given only to those who chose to believe, having faith that overcame fear even when it didn’t make since. Fear of friends, fear of failure, fear of famine, fear of foes, fear of Giants, and fears of woes. Of the over two million who left Egypt, only two proved to have a faith bigger then all their fears, and of the original two million, only these two (Joshua and Caleb) entered into promise. Choose not to be overtaken by the sin of unbelief and die in the wilderness like the Israelites did. Choose to put those thorns under your feet and press on believing, no matter what! And don’t be surprised if it seems that almost no one else “believes” like you do. Almost no one else believed like Johsua and Caleb did and they all missed the promise because of it. There have always only been a few that truly dared to believe, and they were all thought fools for doing so, yet God calls them great before history, and in the end, called them friend and son, saying “well done, My good and faithful one“.